Lucerne (Switzerland) – May 2, 2017 (travelindex.com) – Alain St.Ange, the Seychelles Candidate for the post of Secretary General of the UNWTO will be in Lucerne to join with around 500 participants from 70 countries will walk the talk and work on new business models, share inspiring personal stories and build valuable friendships. Alain St.Ange will also be part of the Think Tank Session on Tourism. Like previous years he is invited by Martin Barth, the President and CEO of the World Tourism Forum. 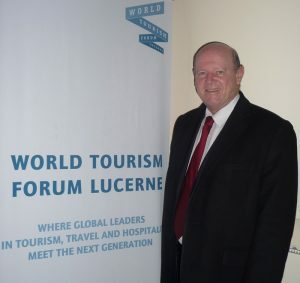 The World Tourism Forum is the last major Tourism Event before the 12 May Elections for the new Secretary General of the United Nations World Tourism Organisation (UNWTO). From Lucerne Alain St.Ange said he was flying back to Seychelles before heading to Madrid for the elections. The Lucerne event is seen as the gathering of key tourism personalities which remains important networking opportunities. “In uncertain times a strong sense of community and good personal relationships can be especially important for success” the World Tourism Forum Organisers says. CEOs, Ministers, Investors and Professors join together at the World Tourism Forum to meet the next Generation and build on such strong relations.